Israel Criticizes U.S. Decision To Deal With Palestinian Government : The Two-Way The new Palestinian unity government includes the militant group Hamas, which Israel and the U.S. view as a terrorist organization. 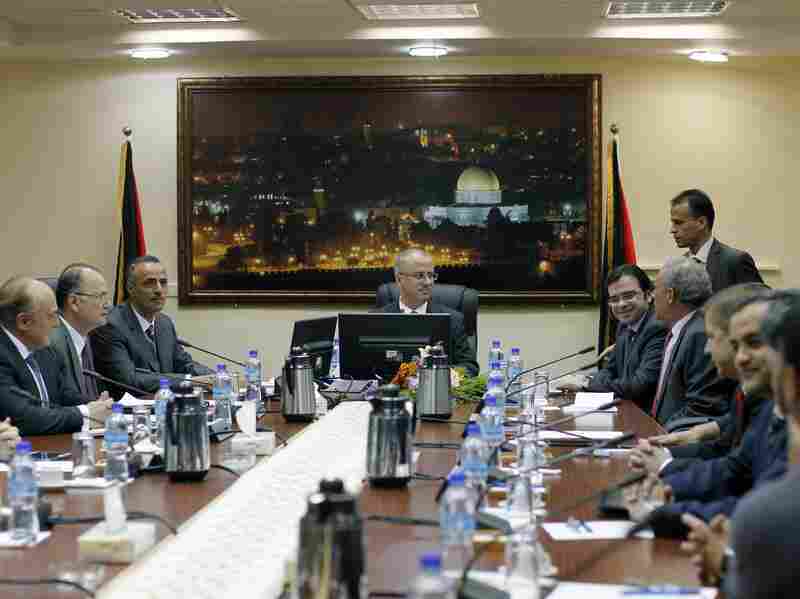 Palestinian Prime Minister Rami Hamdallah (center) leads the first Cabinet meeting of the new Palestinian unity government in the West Bank city of Ramallah on Tuesday. Israeli Prime Minister Benjamin Netanyahu says he's troubled by the U.S. decision to maintain ties with the new Palestinian unity government, which includes the militant group Hamas. "I'm deeply troubled by the announcement that the United States will work with the Palestinian government backed by Hamas," he told The Associated Press, saying the group has murdered "countless innocent civilians." Both Israel and the U.S. view Hamas as a terrorist organization. Netanyahu's comments were echoed by Ron Dermer, Israel's ambassador to the U.S., who told NPR's Steve Inskeep: "What we were hoping to hear was a strong message opposing President Abbas' decision to form a government with an unreformed terror organization. Instead, it sounded more like business as usual." Palestinians formed a new government on Monday that is supported by both major political parties, Fatah and Hamas. The government comes after seven years of bitter and often-violent divisions between the two sides. In response, U.S. State Department spokeswoman Jen Psaki said: "Based on what we know now, we intend to work with this government, but we'll be watching closely to ensure that it upholds the principles that President [Mahmoud] Abbas reiterated today." Abbas, as NPR's Emily Harris reported on Morning Edition, "is the leader of Fatah and remains the president of the Palestinian Authority. The principles he reiterated after announcing new government members are recognizing Israel, renouncing violence, and honoring past agreements. Those are requirements laid down by the international community for recognition of any Palestinian government." "Relations between secular Fatah and Islamist Hamas, the two major Palestinian political parties, are scarred by violence, different views of Israel, and deep distrust of each other." The new government is set to be in place until elections, which are more than five years overdue.